The former US presidential hopeful and Vermont senator in an interview published Friday said the US military aid to Israel has caused a snarl-up in the peace process and favored Israel’s continued occupation of Palestinian territories adding that he would consider reducing it. Speaking to Intercept, the senator who came close to contest vying the presidential seat with Trump during last year elections said the $3.1 billion US annual aid package has provided incentive to Israel to continue its unlawful occupation of Palestinian territories. Sanders noted that the US could play a more even-handed role in ending the decades-long conflict if it reviews its military aid to Israel. Asked if he would consider reducing the aid, the veteran politician said ‘the answer is yes’. For him the US should not support Israel only through arms but have the Jewish state work with other countries and on other issues, including environment. Sanders has been opposed to Israel’s continuing colonization of the West Bank, yet he denounced what he called UN biased policy against Israel. The one who lost to Hilary Clinton in the Democrat race also criticized Washington’s foreign policy towards Iran in favor of Saudi Arabia. “I think that one of the areas that we have got to rethink, in terms of American foreign policy, is our position vis-a-vis Iran and Saudi Arabia,” he said. Acknowledging the legitimacy of international concerns on some of Iran’s foreign policy, Sanders argued that Iran in current state is more democratic than Saudi Arabia. He cited this year elections in Iran and the desire of young Iranians to open up to the western civilization. 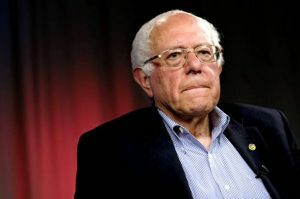 Rejecting that Saudi Arabia is an ally of the US for its alleged support for and spray of terrorism, Sanders noted that part of Washington’s friendly foreign policy towards Saudi Arabia is connected to oil. Written by: KanelkaTagba on September 23, 2017. Posted by KanelkaTagba on Sep 23 2017. Filed under Headlines, World News. You can follow any responses to this entry through the RSS 2.0. Both comments and pings are currently closed.